On behalf of the International and Local Organizing Committees it is a great pleasure to announce the 14th INTERNATIONAL SYMPOSIUM ON CELLS OF THE HEPATIC SINUSOID: Integrating Basic and Clinical Hepatology, which will be held in Tromsø, Norway, August 31 to September 4 2008. As with all preceding symposia in this series, a central goal is to stimulate crossover discussion between basic scientists and clinically based researchers. As progress increases at an accelerating speed at all levels of hepatological science and medicine, it is more mandatory than ever to facilitate the interchange of knowledge between basic and clinical sciences. Some of the fields that will tentatively be included in the scientific program are: sinusoidal liver cell and molecular biology and physiology, mechanisms of liver repair and fibrosis, hepatotoxicity and microcirculation, interactions of cancer cells with hepatic sinusoidal cells, scavenger function and microcirculation, liver immunology and inflammation, mechanisms and effects of aging. In addition to original scientific presentations by the attendees, the tradition of inviting lecturers to give tutorial presentations on selected fields will be continued. 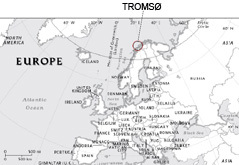 Tromsø is located at the northern tip of the European mainland, and our university is the northern most one in the world. The surrounding nature with high mountains and deep fjords is spectacular. The local organizing committee is working to make the 14th ISCHS in Tromsø a memorable meeting both scientifically and socially. So, seize this occasion to combine good science with exotic environments and make plans to participate at the Symposium in Tromsø the Fall of 2008. 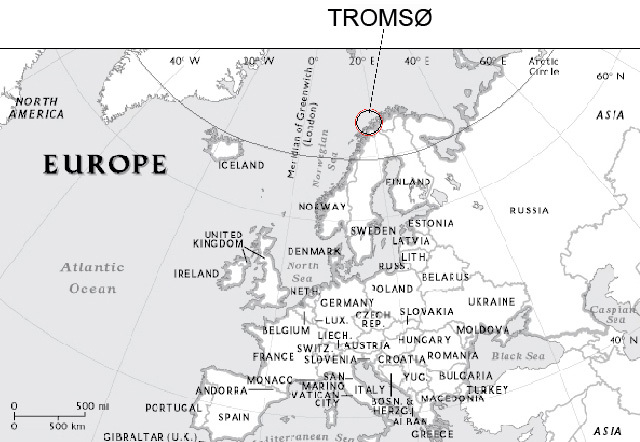 Tromsø in Europe. Click to enlarge. See the new pictures page for pictures from the conference! Attendees with special dietary requirements: please contact Vivi Ann Garibaldi (Vivi.Garibaldi@fagmed.uit.no).